Original dub production, voicing and mixing. dr, dubbist drums / bass / mixin / keys Chris "Cristus" Nerren bass / guitar / keys Matt "Yami" Beebe guitar /bass / keys Martin "Tunny" Moeller synth / melodica . dub, raggae,old 70's hippy stuff my mom played, music,Peter Tosh- King Tubby, Scientist, King Jammy, Agustus Pablo, Mad Professor, Jah Shaka, Lee perry, Roots Radics, Sly&Rabby, Adrian Sheerwood,Twinkle Brothers, Mikey Dread, Jacob-killer-Miller, Linval Thopmson, Jah Thomas, U Roy, Yabby U, Macka B, Rocker T, Dennis Bovell, L.K.J, Prince Far I,Carlton Barret,Dub Head records, Victor Rice, Big youth, all the good stuff, more sh#t i don't know about,heavy soundsystems around the globe 4 the benifit of dub. Close text. This Account Created Feb 10, 2007 5:08 pm. My days as a writer are long gone, But I thought I would go ahead and throw a pic up! We have a variety of stickers available. 18 x 12 Gloss Print, It is pretty self-explanatory. Hunter S. Thompson T-Shirts available in many different shades of blues.Small to X-large. 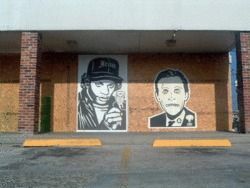 I did these during hurricane Katrina, In Baton Rouge! In Action!, photo by lisa. Cobra Commander poster. photo by lisa. A Tribute to Ed Big Daddy Roth!